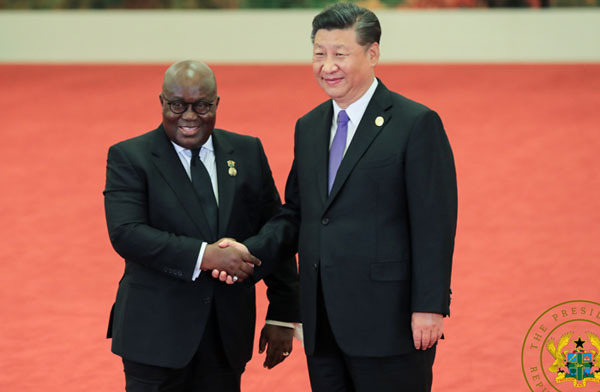 PRESIDENT NANA Addo Dankwa Akufo-Addo has openly showered plaudits on Chinese President, Mr. Xi Jinping, for being a faithful partner. According to him, he is very impressed with the commitment and dedication of the Chinese leader to see Ghana and the rest of Africa develop at a fast rate. The president commended Mr. Xi Jinping for urging Chinese businessmen to troop to Ghana to invest. He recounted that the Chinese leader said several positive things about Ghana when he held bilateral talks with him in Beijing. He stated that he was touched by the strong interest of the Chinese leader in the affairs of Ghana and his heartwarming words about Ghana. He was speaking during the official opening of the Ghana-Shandong Business Forum, which is aimed at improving private businesses in both Ghana and China. Adding to the Chinese leader’s statement, President Akufo-Addo stated that indeed Ghana is a safe place for people that are desirous to do genuine business.